The 26th Annual TicketCity Cactus Bowl will be played on January 2nd, 2015 at Sun Devil Stadium in Tempe Arizona. The 2015 matchup will be between the Washington Huskies from the Pac-12 and the Oklahoma State Cowboys from the Big 12. Kickoff is at 8:15 MT. Dating back to 1989, the TicketCity Cactus Bowl has a long and rich history of delighting college football fans. Originally known as the Copper Bowl, the TicketCity Cactus Bowl has gone through a number of name changes over the years including the Insight Bowl, and Buffalo Wild Wings Bowl. The Bowl features tie-in from the Pac-12 Conference and the Big 12 Conference, giving the TicketCity Cactus Bowl a matchup from two of the nation's top conferences in terms of success and attendance. A number of college football's most memorable players have played in the TicketCity Cactus Bowl, including, Aaron Rodgers, Marc Bulger, Ron Dayne, Le'Veon Bell, and Derek Anderson. TicketCity is a ticket marketplace that specializes in sports events and has been a leading destination for sports tickets since being founded in 1990. 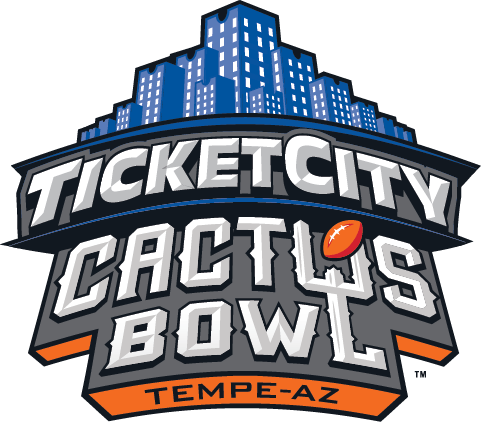 TicketCity previously sponsored the TicketCity Bowl in 2010 and 2011 and returns as the title sponsor of a bowl game in 2015 at the TicketCity Cactus Bowl. TicketCity is reliable connection to more than 100,000 events and backs every order with TicketCity's 100% Guarantee. TicketCity has one of the largest networks of professional suppliers and major media, college and pro team partners including CBS Sports, Baylor Bears, Vanderbilt Commodores, and Houston Cougars. The TicketCity team has over 2 million hours of collective experience and has an on-site presence at major sporting events. TicketCity is committed to giving back and supports numerous community organizations including the American Cancer Society, Make a Wish Foundation, Capital Area Food Bank, Susan G. Komen and The Thinkery. Sun Devil Stadium is located in Tempe, Arizona, and has been the home of the TicketCity Cactus Bowl since 2006. The stadium is on the campus of Arizona State University and is one of the most beloved venues in the State of Arizona. During the TicketCity Cactus Bowl, Sun Devil Stadium will have a capacity of over 65,000, giving the game an electric atmosphere. Sun Devil stadium has a long history of putting on premier college football events, including being the home of the Arizona State Sun Devils football team, the Fiesta Bowl from 1971-2006, and the TicketCity Cactus Bowl.